Located in Downtown Omaha, Magnolia Hotel Omaha is adjacent to Orpheum Theater and within a 10-minute walk of other popular attractions like Omaha Children's Museum. This 4-star hotel welcomes guests with 145 rooms and conveniences like free in-room WiFi, a free airport shuttle, and a fitness center. Sit down for a leisurely bite to eat at the onsite restaurant, or enjoy a drink at the bar/lounge. Satisfy your hunger from the comfort of your room with room service. Start each morning with full breakfast, available for a fee from 6:30 AM to 11 AM. Guests can expect to find free WiFi and 37-inch an LCD TV with cable channels and pay movies. Beds sport premium bedding and the bathroom offers a hair dryer and free toiletries. Other standard amenities include a coffee maker, a phone, and an ironing board. Magnolia Hotel Omaha features a fitness center, free WiFi in public areas, and conference space. Valet parking is USD 20.00 per night if you plan to drive, or hop aboard the free airport shuttle (available 24 hours). The 24-hour front desk has staff standing by to help with securing valuables, concierge services, and luggage storage. Additional amenities include a 24-hour business center, free newspapers, and a fireplace in the lobby. Located in downtown Omaha, this hotel is just three blocks from the shops and eateries of the Old Market, and four blocks from the financial district. The hotel courtyard, with graceful columns, Italian marble, and tranquil fountain, is a pleasant space to relax. The hotel offers a fitness facility, and complimentary wireless Internet access in the lobby. The business center is open 24 hours. There are 9 meeting rooms available. The hotel provides complimentary airport transportation and complimentary 24-hour shuttle service within the surrounding area (limitations apply to both). Smoking is not allowed inside this hotel. 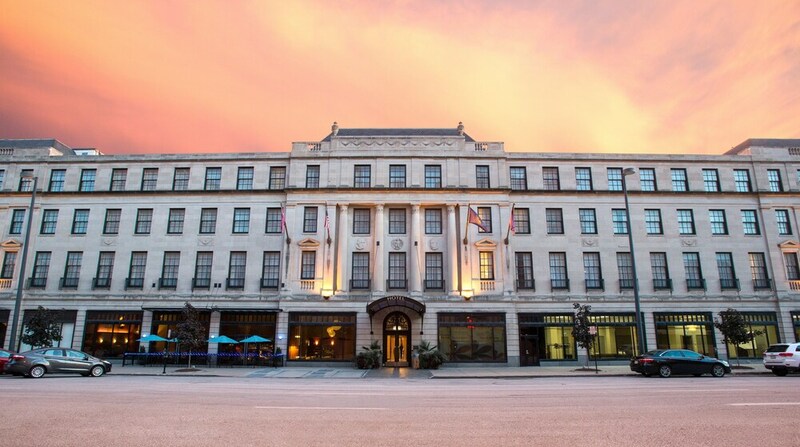 Magnolia Hotel Omaha offers 145 air-conditioned accommodations with coffee/tea makers and hair dryers. Beds feature premium bedding. 37-inch LCD televisions come with premium cable channels and pay movies. Guests can surf the web using the complimentary wireless Internet access. Additionally, rooms include irons/ironing boards and complimentary toiletries. Housekeeping is offered daily and hypo-allergenic bedding can be requested. Start your morning with a full breakfast, available each day from 6:30 AM to 11 AM for a surcharge. You can order up room service during limited hours.